This is another type of machine where there are almost as many versions and variations as there are packaging types out there, but they can all be placed into 4 very broad categories. They are: Self Stick or Glue on, and Roll On or Press On. Roll on and Press on can be either the self-stick of hot glue type as well. The self-stick labelers are the type that peel a self-stick label off a roll and then apply it to a passing package or container. The glue on types usually apply the glue to the label first and then apply it to the package or container immediately afterwards. Roll type machines are for applying the labels to round containers and the press type is usually for boxes or bags with flat sides. There is another type called the shrink band labeler. This machine drops a tube of pre printed plastic seal material around the entire container, which is then passed through a shrink tunnel to cause it to contract tightly around the contours of the container as well as form a tamper proof seal. You can see one of these in the ON THE SPOT ENGINEERING section of this site. 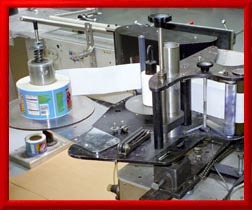 The machine above is hot glue roll type labeler from Labelette. The labels are fed from a flat stack one at a time. The backside is dipped in hot glue as it is stripped from the stack. The leading edge is then applied to the container rolling in a motorized carriage. The rolling action drags the label on the rest of the way around the container and presses it on simultaneously and the job is done and the container can be taken off and the next one applied. This is a semiautomatic labeler. The containers are fed manually but the labels are applied automatically. This machine would not work correctly because the manufacturer had installed a normally closed proximity switch instead of a normally open switch. The automatic cycle would just not work. I could not see why until I bought the Mitsubishi PLC software and used it to extract the PLC program so I could analyze it rung by rung. Once I spotted the problem caused by the switch I just reprogrammed some of the contacts to get the behavior we needed and the machine ran fine.